A spate of bomb attacks against police in Iraq’s disputed oil-rich city of Kirkuk on Thursday killed at least 29 people, the worst violence to hit the country in nearly two months. A further 90 people were wounded in the three attacks, which drew condemnation from the UN’s envoy to Iraq, with just months to go before US forces must withdraw from the country. And in separate bombings in Baghdad and the central city of Baquba, a woman and an imam were killed and 10 others wounded, security officials said. Two car bombs and a magnetic “sticky bomb” attached to a car exploded in the ethnically mixed northern city of Kirkuk, security officials said. The first blast took place at 9:20 am (0620 GMT) when the sticky bomb exploded in the parking lot of the city’s police headquarters, Major Salam Zangan said. When police and emergency responders arrived at the scene shortly afterwards, a car bomb detonated. “I ran out from the headquarters after I heard the first bomb; I went with my colleague to check the parking lot but as we arrived, a huge bomb went off,” said Sherzad Kamil, a policeman who was wounded in the abdomen and face. “I fell on the ground and saw several of my colleagues killed and wounded,” he said, speaking from Kirkuk general hospital, adding he saw colleagues whose bodies caught fire in the second blast. Kirkuk provincial health director Sadiq Omar Rasul said 29 people were killed and 90 others wounded in the three explosions. He said 26 of the dead were police, as were the vast majority of the injured. 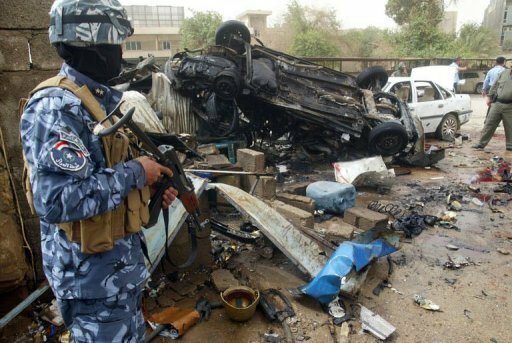 An interior ministry official in Baghdad said 29 people had died and 80 others were wounded, while a senior security official in Kirkuk said 27 were killed. The first two explosions caused massive damage to nearby police and civilian vehicles. Afterwards, several police cars with loudspeakers affixed to them could be heard appealing to people to make their way to the city’s hospital to donate much-needed blood for victims, an AFP journalist said. At around 10:30 am, another car bomb detonated near the convoy of a senior police official in Kirkuk, Colonel Aras Mohammed. Mohammed was wounded in the blast, which seriously damaged several nearby cars and buildings, a Kirkuk security official said. UN special envoy Ad Melkert condemned the attacks in a statement, expressing “concern at the continued acts of violence targeting security and government officials in Iraq”. Kirkuk lies at the centre of a tract of disputed territory claimed by both Iraq’s central government and by Kurdish regional authorities. US officials have persistently said the unresolved row is one of the biggest threats to Iraq’s stability. Currently, US forces participate in confidence-building tripartite patrols and checkpoints with central government forces and Kurdish security officers in Kirkuk and across northern Iraq. But the withdrawal of some 45,000 US troops still in Iraq must be completed by the end of the year. As part of those efforts, American forces handed over Contingency Operating Location McHenry in the town of Hawija, west of Kirkuk, to their local counterparts on Sunday. The attacks in Kirkuk come just a day after the Iraqi army announced the arrest of the alleged military leader of Al-Qaeda’s offshoot in Iraq along with three of his acolytes in a raid. Meanwhile, violence in Baghdad, the central city of Baquba and the main northern city of Mosul left six people dead, including four soldiers, security officials said. Thursday’s death toll was the highest in Iraq since March 29, when a band of Al-Qaeda gunmen and suicide bombers stormed a provincial council building in the central city of Tikrit, killing 58 people. Violence is down dramatically in Iraq from its peak, but attacks remain common. A total of 211 Iraqis were killed in violence in April, according to official figures.